The main story of The Awakening is following the player trying to figure out who he is after he woke up in the forest suffering from amnesia. You encounter the mysterious figure the Golden Demon who seems to know about your past. For a more concise walkthrough of the game, see the Walkthrough article. Awakened - You begin by waking up in Everthorn forest, not remembering who you are. You walk around and come across a burnt area of the forest, that may have something to do with what happened to you. 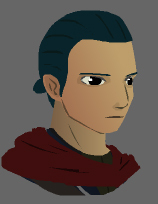 Later you meet the sorcerer Caleb who is about to be attacked by a bandit. You help him kill the bandit, and you learn he is heading towards the city Bavelock. You decide to follow him and Caleb joins you. Bavelock City - You arrive in Bavelock and Caleb takes you to see Argas in his gym to practice some new combat moves, while he goes away for a while to sell some goods. Argas teaches you to counter attacks from enemies. When the training is done, you decide to talk to people around town, the first one being Jaden who's in the gym. You start the "Helping Jaden" sidequest. Brock is working on a new sword and wants Argas' approval that it's good enough. He gives you the sword and you show Argas it. But he wants to see it in a real battle and Luvannon summons a Gornak for you to fight. Defeat the Gornak and Argas says he is impressed. Return to Brock and he will take the sword back but will add a status effect on your old sword, as a reward for helping him. When that sidequest is done you have to finish another optional sidequest before you meet Caleb in the Golden Apple inn. Caleb tells you a little bit about his past and how he lost his sight, but can still see the world around him with a sixth sense he was born with. He tells you that next morning he is heading towards Savina to sell some more of his goods in the marketplace there. 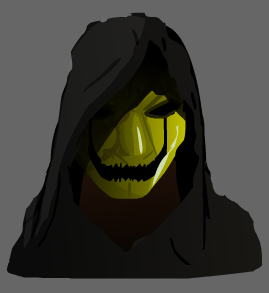 He also tells you about the Golden Demon; a dark, powerful, hooded sorcerer that has been sighted recently. On the road again - One the way to Savina you pass Gwydion forest. While in there Caleb teaches you about magic, and you learn the spell Heal. Caleb can now cast Chaos and Dementia. On the way to Savina you pass Blackwhisper Cave, but Caleb advises you not to go in there. You continue to Savina city. 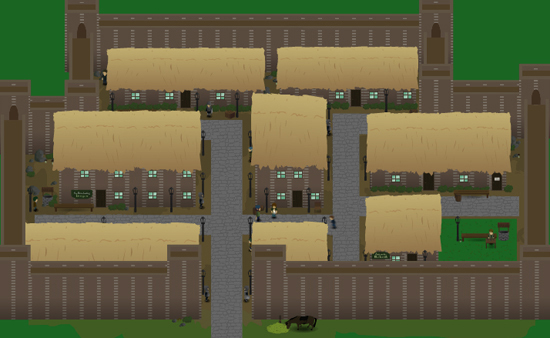 Savina City - When you arrive to Savina you head to the Slumbering Dragon inn. There you meet Dion, a mysterious warrior who talks about the Golden Demon. He says the Demon sent him to see if you were still alive. Dion then teleports away. You and Caleb are confused but decide to spend the night at the inn. The marketplace - Next morning you head to the marketplace. Caleb goes off on his own and you head to the second floor and meet Leon. He is selling a mysterious crystal that you are drawn to. After winning the item in 3 rounds of shell game, you ask Leon where he got the crystal. He tells you there might be more of them in Blackwhisper Cave. You go back to the first floor and show the crystal to Caleb. He feels it holds immense power but does not know what it is. Meanwhile he shows you a map he bought, but as this happens a child runs and grabs the crystal and runs out of the building. This starts a chase scene where you chase him out of the city. The child runs to Dion who is standing outside the city walls, waiting for him. He refuses to give the crystal back and he fights you. During the fight you get your first Limit Break attack, from whatever power is inside the crystal. You win the fight and Dion teleports away again, severely wounded. The crystal that he stole lies on the ground, you pick it up. Blackwhisper Cave - You and Caleb decide to continue to Blackwhisper Cave, where Leon said the crystal was found and where there might be more of them. You walk through the dark cave and in a big room at the very end of the cave, you find another crystal piece that infuses you with the same power the first crystal did. It causes a minor explosion that makes the instable cave shake and fall apart. You run out but meet the Phantom Stalker in a timed boss battle. You must defeat it in 2 minutes or you both die. The Golden Demon - You run out of the cave and Caleb tells you that Bavelock has a big library, maybe there you can find answers about the crystals you have. You head to Bavelock but on the way you meet the Golden Demon right outside the city walls. He says he seeks the shards of the Tear of Neriah You fight him but cannot make any real harm to him. He steals the crystals and disappears and summons a Carrion Hound to take care of you. You are poisoned and barely survive. You faint and suddenly are standing in a white empty field. You walk along a golden path that leads to the Golden Demon standing in font of a burning tree. He says he has killed you already and is surprised to see you are alive. He speaks in riddles about the world ending and how the world must find peace in death. 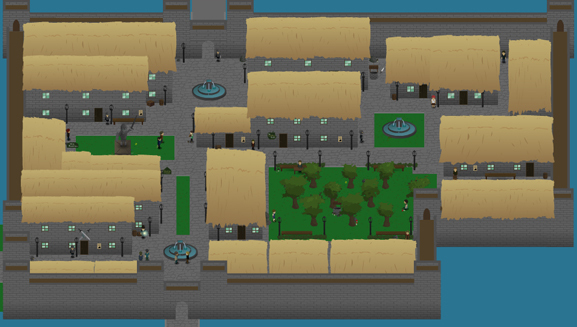 Bavelock in lockdown - You suddenly wake up in a room in the Golden Apple inn. You meet Caleb downstairs who tells you he killed the Carrion Hound and carried you to the inn for help. He stays in the inn while you go to the library and seek information about the Tear of Neriah. But before you go inside the library you meet a guard who recognizes you as the man who fought the Golden Demon. He tells you the city is in lockdown because of the Demon, no one is allowed in or out the city walls because of the danger. The Tear of Neriah - You ask a library attendant about the Tear of Neriah and read a book that explains how the goddess Neriah after seeing the evil and selfishness of mankind shed a tear that fell upon earth. It crystallized and was found by the Sundarmis tribe of the mountains who knew how to harness the godlike power that was inside the crystal. The Sundarmis became masterful magic wielders who gathered their power from the crystal that they placed upon the White Tower. They prospered and their kingdom grew strong. It grew too strong, and the tribe elder Aduviat was said to have challenged the gods. The people were so empowered by the Tear of Neriah and its magic that they began to see themselves as among the gods. When Aduviat challenged the gods, the heavenly beings released their full wrath on the Sundarmis kingdom and crushed it to marble. And the Tear of Neriah was shattered into four pieces and sent to the four courners of Andora. If all four are gathered and held by a Sundarmis-born it is said to cause an event where all the godlike force within is fused with the owner. Escaping the city - You decide to hunt down the Demon and take back the crystals he took. But Caleb is feeling doubtful and says if you can conjure up a miracle, he will follow you. If you can find a way out of the city and if you know where the Demon might be, he will fight with you. Talk to the guard in the inn, he says a troop of soldiers were sent to Mogwai Mountains, based on reports that the Demon is heading towards it. Then talk to Farimir in the inn, he asks you to buy a drink for him. He says he knows a way out of the city. Buy him a drink and he will tell you about an underground passage that leads out of the city that someone named Darcon in the Bavelock prison might know about. Farimir then passes out in a drunken stupor. Prison break - You go to the prison, but there is a guard telling you cannot go in and talk to Darcon. You remember that Argas trains soldiers and might have an official guard uniform. You go to the second floor of the gym and put on a guard uniform and head back to the prison. You trick the guard into thinking that you are a high ranking officer and he grants you passage. You walk up to Darcon's cell and talk to him. You tell him that you can help him break out of prison if he helps you find the passageway leading out of the city. You distract the prison guard while Caleb desintegrates the cell bars with his magic. You run out and Darcon leads you to a building in the most north-eastern corner of the city. The door is locked, but Darcon tells you it is not his problem and leaves you. Caleb opens the door with his magic spells. Inside you meet Agga, a ghost and protected of the Thieves' Passage. He will not let you pass unless you can answer his riddle. "Soundless it flies. It's faster than me. In darkness it dies. It's all we can see. Thieves' Passage - Inside the Thieves' Passage there a lot of winding halls and locked gates that need to be opened by corresponding levers. But the first obstacle you meet are two bandits who require you to say the "thieves' password" to pass, or they will fight you. There is a small bookshelf near the beds with a book that will tell you the "thieves' password". Read it and talk to the bandits again, or simply fight them. Walk through the passage, open all the gates and climb up the eastern ladder. Mogwai Mountains - You now stand outside Bavelock and you head east towards the Mogwai Mountains. When you arrive there you see a fat creature sleeping on the road. At this point Douglas Gavelin pops up, telling you that the game is unfinished and that it ends here. If you played the game on the hardest difficulty, you get the Soulcleaver sword here. To read about the future of the story, read the Future story article.